Peterhead chairman Rodger Morrison with Les Hill, managing director of LFH Engineering. Ellon-based pump manufacturer LFH Engineering is among the first group of companies to sign up to the Peterhead FC patronage scheme. The scheme is aimed at establishing a group of individuals and businesses that will take an active interest in the promotion of the club. By becoming patrons, companies are pledging their support through various means from encouraging staff to attend matches to spreading club news in the effort to stimulate an awareness of the club both on and off the field. Also as part of the patron privilege and recognition, further opportunities for club vehicle, ground orkit sponsorship will be made available. It is hoped that the scheme will help emphasise the club’s commitment to building strong relationships with the north east business community as it looks to continue its recent success. Les Hill, managing director of LFH Engineering said: “Since LFH was established in 2010, the company has been supporting Peterhead FC through a variety of different ways and we really did jump at the chance to become a club patron. “ Our roots are in Peterhead and I’ve always been of the belief that it is key to support the area you operate within. “Peterhead FC was a nice fit both for the company and from a personal viewpoint. 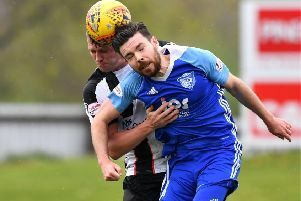 “Peterhead FC is a great club that has a connection with so many people in the north-eastand we’re looking forward to playing a part in any future success that comes its way”. Rodger Morrison, chairman of Peterhead FC said: “ We are absolutely delighted that LFH have agreed to become a patron of the club. LFH Engineering was launched in 2010 and designs and manufactures pumps for ship propulsion systems, diesel power plants and the railway locomotive sector. They won the Overall Small Business of the Year accolade at the Northern Star Business Awards 2011 and currently employ 38 staff at Ellon and are about to open a second manufacturing facility in China.